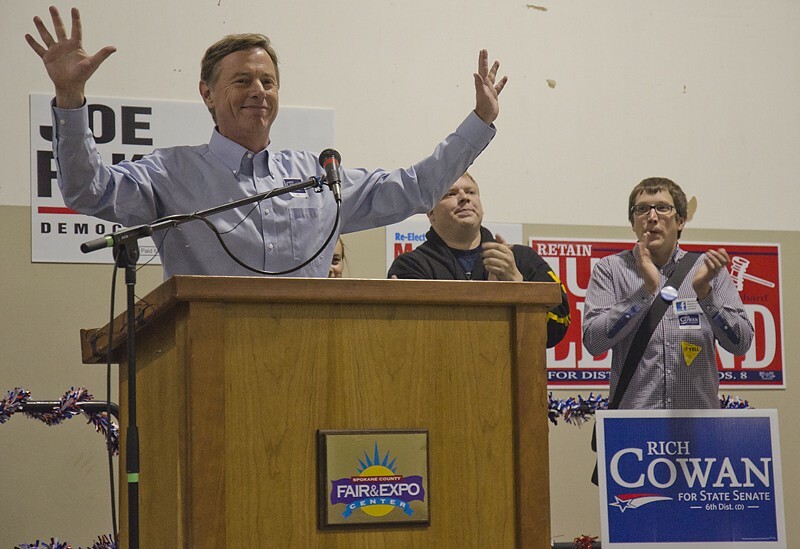 Hundreds of union workers gathered at the fairgrounds Wednesday for the annual labor rally. 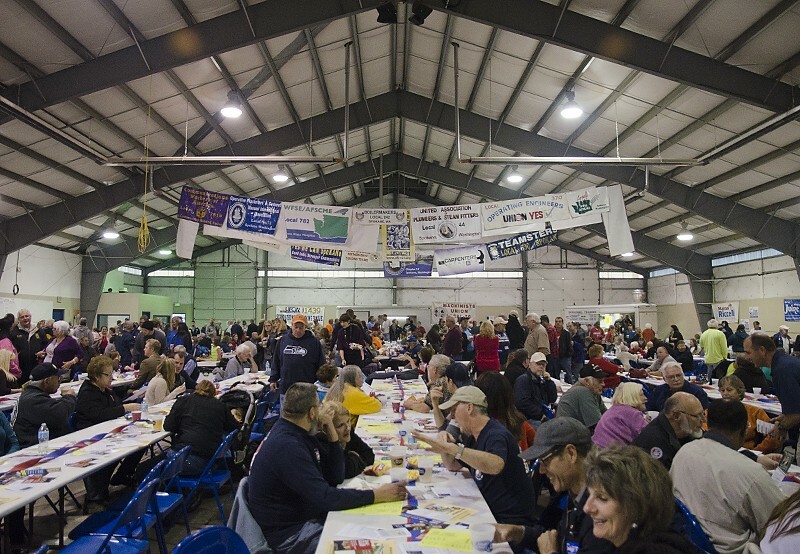 Hundreds of local union members gathered Wednesday night for the annual Spokane Labor Rally to cheer on endorsed candidates, meet labor leaders and eat hotdogs. Organizers handed out fliers with election information while workers enjoyed live music and beer. Jeff Johnson, president of the Washington State Labor Council, welcomed in employees to the Spokane Fair & Expo Center from a wide variety of unions, ranging from public sector to pipefitting. 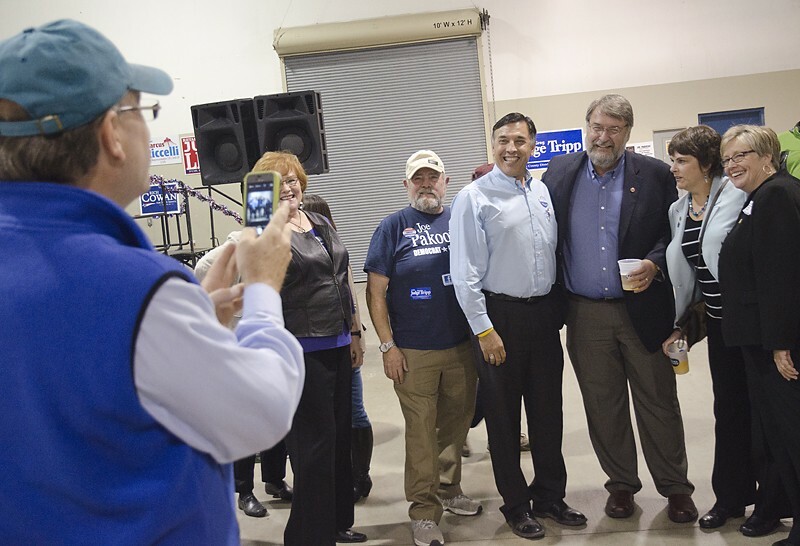 Congressional candidate Joe Pakootas, center, gets a photo with labor leaders. "We are so proud to be here tonight with Spokane labor," he shouts. Joe Pakootas, who is challenging U.S. Rep. Cathy McMorris Rodgers for the 5th congressional district, took the stage to chants of "Go Joe!" Criticizing her record on workers' and women's rights, he describes McMorris Rodgers as a member of the "most dysfunctional, unproductive Congress in history." "We need someone on Capitol Hill who will protect American workers," he tells the crowd. "Now is the time for dialogue that will create change. … We can do better!" Several other union-endorsed candidates stepped forward to introduce themselves and champion organized labor. State Senate candidate Rich Cowan, the founder of North by Northwest film productions, highlighted his efforts to bring jobs to Spokane, including the recent recruitment of the Z Nation zombie TV series. State Senate candidate Rich Cowan addresses union members at the rally. "We haven't organized the zombies yet," he jokes. County Treasurer candidate Amy Biviano addressed the crowd as "brothers and sisters," emphasizing the importance of investing in local companies. Mary Lou Johnson, the Democratic candidate for Spokane County Commissioner, asked for union support to unseat conservative Commissioner Al French. "Join me in a 'Goodbye, Al'" she says, waving farewell. Rally organizers passed out mock ballots with their recommended candidates filled in to help reinforce endorsements. Attendees could also peruse booths with information on many of the candidates or local unions. On top of Lookout Pass: Snow!